Carl Claudius, Rudolf Nydahl and Daniel Fryklund are the most important Scandinavian collectors of musical instruments and musicalia during the 20th century. Carl Claudius (1855-1931) was from Denmark but was partially working in Sweden and one of the of the founders of Musikmuseet (the Music museum) in Stockholm 1899. The lesser known Rudolf Nydahl (1882-1973) created his own museum: the Stiftelsen Musikkulturens främjande (The Foundation for the Advancement of Musical Culture) in Stockholm 1920, but Fryklund donated his whole collection to existing museums and libraries. The fine collections of musical instruments and musicalia in the music museums in Stockholm and Copenhagen are to a considerable extent the result of the efforts of these three men. Lars Axel Daniel Fryklund was born on 4th May 1879 in Västerås. His parents were the merchant Lars Fryklund and Maria Sofia Abrahamsson. He had two older sisters, Ada Laurentia (1874-1953) and Maria (1872-1958). In his booklet "Att samla musikinstrument" he describes how he became interested in old musical instruments. When he was a small child his father handed him a violin, dated Stockholm 1784, by the Swedish maker Daniel Wickström. Fryklund became interested particularly in the maker's label and most fascinating was that the last number of the year was difficult to read and thus could be an object for speculation. His father played several instruments (violin, piano, organ, flute, clarinet and guitar) and many of these were antique which must have stimulated the young Daniel. He went through the secondary school in Västerås and took his matriculation examine in 1898. He played (probably violin) in the orchestra of the school. He became bachelor of arts in 1903 and Ph.D. in 1907 at Uppsala university, specialising in modern languages. During his stay in Uppsala he took violin and music lessons with Lars Zetterquist and Ivar Hedenblad. He also played with the academic orchestra. After that he worked as a secondary-school senior master in languages (Swedish, German, French and Spanish) in Sundsvall 1910-1921 and in Helsingborg from 1921 until his retirement in 1944. Whenever Fryklund came across violins and other instruments he looked for maker's labels. He started to study books about musical instruments and became curious about the etymology of their names. This led to further investigations of instruments in museums and in collections, starting in Sweden but soon during his voyages to Europe also in foreign museums. He heard about the important collector Carl Claudius in Denmark and the latter was probably Fryklund's main source of inspiration in collecting musical instruments and other musicalia. They later on became friends. 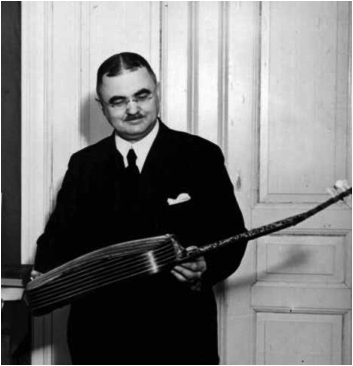 Fryklund in his booklet describes his first acquisition of an antique musical instrument. In a musical instrument dealer's window in Leipzig c. 1912 he saw a beautiful pochette and after having walked around the quarter ten times he dared to go in and ask for the price. It was reasonable and so started the wild pursuit for more instruments and other musical items which lasted almost until his death. Fryklund travelled all over Europe during his life and he bought and brought instruments in abundance and piles of music and music literature to Sweden. It seems as if he spent almost all of his resources on buying and collecting. No wonder he never married! During the first decades of this century it was still possible to get hold of many rare things and particularly after the first world war. Fryklund describes how he bought some rare items in Germany and had to pay in piles of the inflated German Mark. Many instruments probably was acquired in Sweden. From his correspondence it is clear that he received many offerings from private persons. According to Sohlmans' musiklexikon his collection comprised about 900 musical instruments, a large collection of books about music, printed and manuscript music, programs, posters, pictures and about 10000 autographs and letters. In the collection are housed separate collections on the two world-famous Swedish singers Jenny Lind and Kristina Nilsson as well as on the Danish composer August Bournonville. His collection of material concerning the Marseillaise is quite outstanding and unique in the world. He evidently (and rightly so) was very proud of his collection and this was extensive enough to occupy him with studies during his long life. He has described the collection on several occasions in his books "Musica" and "Collection Fryklund". From 1921 he kept the whole collection in his beautiful seven-room flat on the third floor at Wieselgrensgatan 8b in Helsingborg. He often arranged exhibitions in other museums but the collection was mainly kept in the flat and it nearly turned into a museum. It was indeed scanty furnished with only the most indispensable pieces of furniture. Most of the space was occupied with musical instruments, books, autographs etc. On the kitchen walls Fryklund kept his wind instrument collection! Even the cloak-room was filled with instruments. His collection of autographs was partially wrapped in old newspapers scattered about. His guests often were provided with wine, cookies and chocolate creams. The atmosphere was accentuated with candle lights, flowers and draping of the Tricolour. Daniel Fryklund was very sensitive about moods. The main part of his articles and books concerns his own collection, but often this led him to make further investigations into other collections and libraries. Many of his musicological articles were printed in small editions of 25-200 copies at his own expense and they seem to have been given to friends, colleagues and libraries. Many of the copies I've seen have written dedications by Fryklund. Due to the very limited editions many of these prints are rare and hard to find today. When Fryklund died on 25 August 1965, after a long period of illness, at Bergalid boarding house his complete collection as well as his property was donated to the Royal Academy of Music and placed in the academy's library and in Musikmuseet, both in Stockholm. Parts of his collections had earlier been donated to the museum of Helsingborg. His private archive is kept in Musikmuseet in Stockholm. It comprises 28 boxes with his manuscripts, note books, correspondence (10 boxes), personal acts, note books, manuscripts of articles, guest books, photographs etc. and seems to be very complete. He didn't seem to have thrown away anything. He made careful notes of his acquisitions, where, when and of whom he bought his instruments. In his archive there is a chronological list in manuscript of his acquisitions between 1930 and 1953. As is stated above he made several catalogues of his collections and paid much attention to get as much information as possible about every instrument. The correspondence shows that he had a rich net of contacts all over the world including fellow collectors, musicologists, dealers in antique musical instruments, makers of musical instruments and other specialists in the same area of interest. He kept a close contact with the musicologist and head of Musikmuseet, Tobias Norlind. His correspondence with Norlind was quite extensive and he visited Norlind in Stockholm regularly several times each year to discuss their mutual interest in musical instruments. Fryklund's letters to Norlind are in Norlind's archive also in Musikmuseet, Stockholm. We have only a few glimpses about the person Daniel Fryklund. One is found in the recollections of a friend of his, Ruben Edelman. They were both members of the Alliance française in Helsingborg. Edelman describes Fryklund as a reticent but affectionate person who showed immense gratitude over the minutest favour or act of friendliness. This is confirmed by other people who once knew him. As a teacher he was exceptionally energetic and well prepared. He did not take action or decide anything before he had pondered over it extremely and he was very anxious always to do the right thing. One of his biographers compares him with Tartarin de Tarascon, the French bachelor and collector described by Alphonse Daudet. His outward resemblance with the Soviet politician Vjatjeslav Molotov resulted in many caricatures which can be found in his archive and he was obviously amused by this resemblance. He was a man with regular habits and every day at exactly the same time he went home, had coffee or tea with two biscuits and a cigarette. It was a precious moment of rest. He had his other meals at Nya Sällskapet-Handelsklubben [New Society-Club of Commerce] and he always sat in the same place in an old leather-covered sofa. When the premises were restored and the sofa was thrown away Fryklund felt lost and ill at ease. Despite his shyness he took part in many social activities. He was member of several clubs and societies: member of the committee of L'Alliance française in Helsingborg from 1930 and president there since 1940. On 24 May 1932 he became associated member of the Royal Musical Academy of Sweden. In 1950 he became honorary member of Musikmuseets vänner [The Friends of the Music Museum] and he was chairman of the Helsingborg Museum Society until 1955. He was honoured by the French state and became both "officier de l'Académie française" and received "La Croix de Chevalier de la Légion d'Honneur" in 1937. In 1956 he was awarded a medal "För tonkonstens främjande" (For the Promotion of the Science and Art of Music) by Kungl. Musikaliska Akademien (The Royal Academy of Music). Translations of titles in English and in square brackets are editorial. Afrikanska musikinstrument i Sundsvalls läroverks etnografiska samlingar [African Musical Instruments in the Ethnographic Collections of the Secondary School of Sundsvall]. (Bil. till Redogörelse för Sundsvalls högre allmänna läroverk 1914/1915). Sundsvall 1915. 38 pp. Att samla musikinstrument [On Collecting Musical Instruments]. Hälsingborg 1937. 18 pp. August Bournonville. Hälsingborg 1929. 29 pp. Beiträge zur Kenntnis des Baryton. (Deutsche Instrumentenbau-Zeitung, 10 Sept. 1925, pp. 532-533). 2 pp. Bidrag till gitarristiken [Contributions to the History of the Guitar]. (Svensk tidskrift för musikforskning 13/1931, pp. 73-129). An English translations is published here. Bidrag till kännedomen om viola d'amore [Contributions to the Knowledge of the Viola d'amore]. (Svensk tidskrift för musikforskning 3/1921, pp. 1-36). Blåsinstrument av glas [Wind Instruments of Glass]. Hälsingborg 1934. 7 pp. Brev från Bernhard Crusell [Letters from Bernhard Crusell]. Sundsvall 1918. 44 pp. Brev från Gunnar Wennerberg [Letters from Gunnar Wennerberg]. Hälsingborg 1923. 20 pp. Catalogue de la Bibliothèque de l'Alliance Française de Helsingborg. Hälsingborg 1938. 11 pp. Colascione och colascionister. (Svensk tidskrift för musikforskning 18/1936, pp. 88-118). Collection Fryklund. Musica. Hälsingborg 1929. 109 pp. Collection Fryklund, Hälsingborg. (Glareana No. 5/6 1953, pp. 4-6). Collection Fryklund 1949. Hälsingborg 1949. 50 pp. Contribution à la connaissance de la correspondence de Fétis (Svensk tidskrift för musikforskning 12/1930, pp. 85-154). Die Sammlung der Musikinstrumente im Städtischen Museum in Hälsingborg. Hälsingborg 1939. 3 pp. Die Sammlung der Musikinstrumente im Städtischen Museum in Hälsingborg. Zusammenfassung von einem schwedischen Aufsatz "Samlingen av musikinstrument i Hälsingborgs museum" in "Kring Kärnan", Hälsingborg 1939. (Glareana 1953, II:3, pp. 1-3). Also published separately in Hälsingborg 1939, 2 pp. Die Viola d'amore. (Musik-Instrumenten-Zeitung, Berlin 32/1922 No. 7/8, . p. 219. Éditions anglaises de la Marseillaise. Hälsingborg 1936. 15 pp. En pochette d'amour af Thomas Edlinger d.ä. [A Pochette d'Amour by Thomas Edlinger the Elder]. Sundsvall 1918. 10 pp. En samling Marseljäsen utställd i Musikhistoriska föreningen i Uppsala [A Collection of the Marseillaise Exhibited in the Society of Music History in Uppsala]. Hälsingborg 1937. 14 pp. Ett brev från Rouget de Lisle [A Letter from Rouget de l'Isle]. Hälsingborg 1936. 7 pp. Etymologier för och betydelseskridningar hos några engelska benämningar på musikinstrument [Etymologies for and Changes of Meaning in some English Terms for Musical Instruments]. Undated and unpublished manuscript. 75 pp. Musikmuseet, the private archive of Daniel Fryklund, capsule 1. Exposition de la Marseillaise. Helsingborg 1942. 15 pp. Förteckning på Edward Lights musikaliska verk [A Catalogue of the Musical Works by Edward Light]. Hälsingborg 1931. 25 pp. Handlingar rörande hovkapellister [Acts on Court Musicians]. Hälsingborg 1926. 32 pp. Henriette Nissen. - Siegfrid Saloman. Hälsingborg 1929. 18 pp. Hymne des Marseillais. Helsingborg 1933. 8 pp. Jenny Lind. Utställning. Hälsingborg. 1944. 7 pp. L'Alliance française de Helsingborg 1930-1940. Hälsingborg 1940. 12 pp. La Marseillaise dans les pays scandinaves. Hälsingborg 1936. 39 pp. La Marseillaise en Allemagne. Hälsingborg 1936. 32 pp. Le galoubet provençal. Hälsingborg 1939. 8 pp. Les changements de signification des expressions droîte et de gauche dans les langues romanes et spécialement en français. Thèse. Uppsala 1907. 165 pp. Marseljäsen [The Marseillaise]. Ett 150-årsminne. Hälsingborg 1942. 19 pp. Min hobby: Att samla musikinstrument. Radioföredrag 26 juli 1937 [My Hobby. To Collect Musical Instruments. Radio Lecture 26 July 1937]. Undated and unpublished manuscript. 8 pp. Musikmuseet, the private archive of Daniel Fryklund, capsule 1. Musikbibliografiska anteckningar [Bibliographical Notes on Music]. (Svensk tidskrift för musikforskning 10/1928, pp. 158-203). Några svenska uttryck för begreppet h u v u d och deras motsvarigheter i andra språk [Some Swedish Expressions for the Conception "Head" and their Counterparts in other Languages]. Uppsala 1911. 10 pp. Om uppkomsten af betydelsen prison hos franska violan [On the Origin of the Meaning of prison in the French Tenor Violin]. Undated and unpublished manuscript. 9 pp. Musikmuseet, the private archive of Daniel Fryklund, capsule 1. Rouget de Lisle och Marseljäsen i en svensk samling [Rouget de l'Isle and the Marseillaise in a Swedish Collection]. Hälsingborg 1936. 7 pp. Samlingen av musikinstrument på Ystadsutställningen 1936 [The Collection of Musical Instruments in the Ystad Exhibition 1936]. Hälsingborg 1936. 7 pp. Studien über die Pochette. Sundsvall 1917. (Bilaga till Redogörelse för Sundsvalls högre allmänna läroverk 1916/1917). 32 pp. Studier över galoubetn [Studies on the Galoubet]. Hälsingborg 1939. 24 pp. Studier över marintrumpeten [Studies on the Trumpet Marine]. (Svensk tidskrift för musikforskning 1/1919, pp. 40-57). Svenska musikinstrument i utländska samlingar [Swedish Musical Instruments in Foreign Collections]. This publication has not been located. Source: Langwill, Lyndsay G., Fryklund, (Lars Axel) Daniel. (The New Grove Dictionary of Music and Musicians. 6. London 1980, p. 879). The reference probably refers to a manuscript with the same title and consisting of 18 pp. in Musikmuseet, the private archive of Fryklund, capsule 5. Två brev från Ambroise Thomas [Two Letters from Ambroise Thomas]. (Svensk tidskrift för musikforskning 21/1939, pp. 154-157). Två brev från Louise Michaëli och Signe Hebbe till Astolf Möller [Two Letters from Louise Michaëli and Signe Hebbe to Astolf Möller]. Hälsingborg 1929. 7 pp. Une lyre-guitare d'Ory. Helsingborg 1957. 12 pp. Utställning av musikinstrument ur Daniel Fryklunds samling i Hälsingborg... Katalog. [Exhibition of Musical Instruments from the Collection of Daniel Fryklund in Hälsingborg... Catalogue]. Hälsingborg 1945. 80+16 pp. Vergleichende Studien über deutsche Ausdrücke mit der Bedeutung Musikinstrument. Uppsala 1910. 38 pp. Viola di bardone. (Svensk tidskrift för musikforskning 4/1922, pp. 129-152). Daniel Fryklund contributed with many articles to the first edition of Sohlmans musiklexikon, published in Stockholm 1948-1952. He was furthermore responsible editor for the articles concerning musical instruments. Many other articles about Fryklund and his collections appeared in Swedish and foreign newspapers during the years. Press-cuttings from these can be found in his private archive, capsule 28. Many thanks to Birgit Kjellström and Birgitta Dahl from Musikmuseet, Anna Lena Holm and Veslemöy Heintz from the Music Library of Sweden and Karin Tenggren, former assistant to Tobias Norlind, who have provided useful information for this article.